CARLE PLACE, N.Y. (CNS) — Paul Cartier, an organist at Our Lady of Hope Church in the Diocese of Rockville Centre, finds himself in sports heaven at this time of the year. 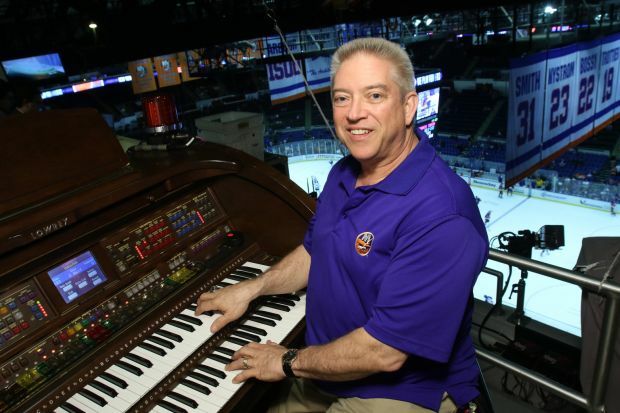 In addition to his parish duties, Cartier plays the organ for Major League Baseball’s New York Yankees and the National Hockey League’s New York Islanders. With baseball season and hockey’s postseason underway, Cartier is a busy man, driving between his home in South Hempstead and his jobs at Our Lady of Hope in Carle Place, Yankee Stadium in the Bronx, and Nassau Veterans Memorial Coliseum in Uniondale. He also averages more than 15 hours a week as a volunteer commissioner, firefighter and emergency medical technician with the South Hempstead Fire Department. Cartier’s schedule was even more hectic when he held a full-time position as a Federal Aviation Administration air traffic controller, a job he retired from in January. A lifelong sports fanatic, the 56-year-old musician admits to “living a dream,” getting paid to play the organ for his two favorite professional teams. “I have to pinch myself,” he told Catholic News Service during an interview conducted in the organ loft at his parish church. “There are probably a lot of people who wish they could be doing what I’m doing. Cartier has been an organist at Our Lady of Hope since the parish was founded in 1987. In recent years, he’s played primarily at the Saturday vigil Mass. He also is a substitute organist at three other Catholic churches. Our Lady of Hope’s 3.5-mile distance from Nassau Coliseum enables Cartier to cover the 5 p.m. Saturday Mass and arrive in ample time for a 7 p.m. Islanders’ game. From his home, he can complete the 25-mile drive to Yankee Stadium — where he plays at weekday games — in about a half-hour. When baseball and hockey season overlap, as they do now and in the fall, Cartier may be scheduled to play the organ at Yankee Stadium and Nassau Coliseum on successive days or on the same day. Arrangements are made for fill-in coverage when conflicts arise. Cartier’s stamina was put to the test recently when he sat at the Yankee Stadium organ console for nearly eight straight hours. On April 10, the Yankees hosted the Boston Red Sox in a game that began at 7 p.m. It unfolded into a 19-inning marathon, with Boston winning 6-5 when the final out was recorded at 2:13 a.m.
After arriving home after 3 a.m., and sleeping until 10, Cartier headed out a few hours later to the Coliseum, where he was on duty for the Islanders’ final regular-season home game on Long Island. Beginning next season, and after 43 years in Uniondale, the Islanders will play their home games at the Barclays Center in Brooklyn, about 25 miles west of the Coliseum. Admittedly tired after the extra-inning contest, Cartier got a second wind when he arrived at the Coliseum, where the crowd was already in a frenzy, cheering the team during the pre-game festivities. Cartier’s biggest thrill as an organist came in 2009 when he was at Yankee Stadium for New York’s World Series-clinching victory against the Philadelphia Phillies in Game 6. “That was fun,” said Cartier, who rode on a float during the team’s championship parade down Broadway in New York City. He and other team employees were given World Series rings. Cartier’s infatuation with the organ began at an early age. It was love at first sight when, at age eight, he was introduced to his aunt’s new Magnus electric chord organ — a play-by-number-and-letter plastic tabletop instrument popular in the 1960s and ’70s. “I sat down and started to play, and loved it immediately,” he recalled. Cartier’s parents subsequently bought him a similar organ, which he mastered before taking formal piano lessons for more than a year. Confident in his music skills, Cartier wanted the opportunity to play the organ at Queen of the Most Holy Rosary Church in Roosevelt, the family’s parish. The music director, impressed with his command of the instrument, allowed him to play at a Saturday vigil Mass. The audition was a success, earning Cartier the Saturday night assignment, which he held for seven years until he began college at the University of Dayton in Ohio. After a year at Dayton, Cartier decided to return home to Long Island, where he enrolled at Hofstra University in Hempstead. He graduated from the school with a bachelor’s degree in music education. While at Hofstra, Cartier played the organ Sunday mornings at United Methodist Church of Uniondale at 10 and at St. Martha Church, a half-mile away, at 11:45. One of those conflicts occurs April 19, when the Islanders face the Washington Capitals at Nassau Coliseum in a first-round playoff game that starts at noon. Cartier’s 3-month-old granddaughter, Lina Grace — the first grandchild of Paul and his wife of 25 years, Jan, a retired nurse — is scheduled to be baptized at Our Lady of Hope at 1 p.m.
Cartier plans to play the organ at the Coliseum for pre-game introductions and for most of the first period before making the five-minute drive to the church. The team’s production staff has recorded Cartier’s music and will use the recording in his absence. Asked if there are other dream jobs he’d like to pursue as an organist, Cartier said his “bucket list” includes playing one of two massive Wurlitzer pipe organs at Radio City Music Hall in New York during the Christmas season.